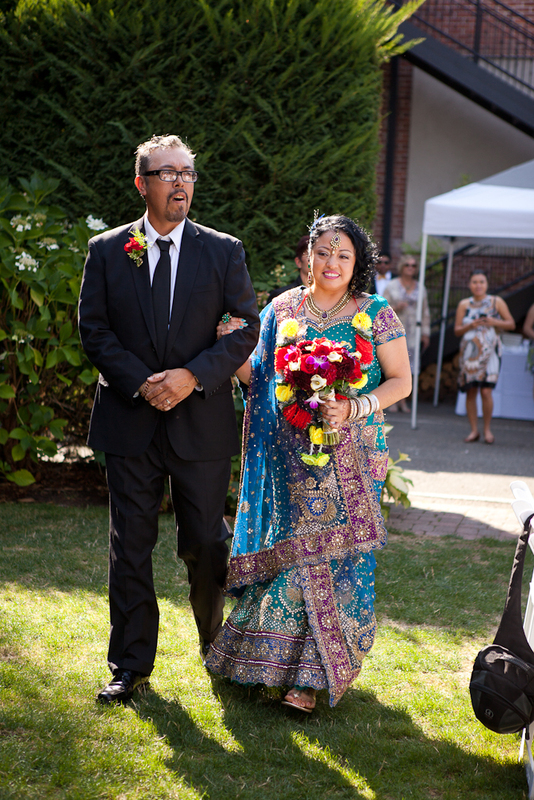 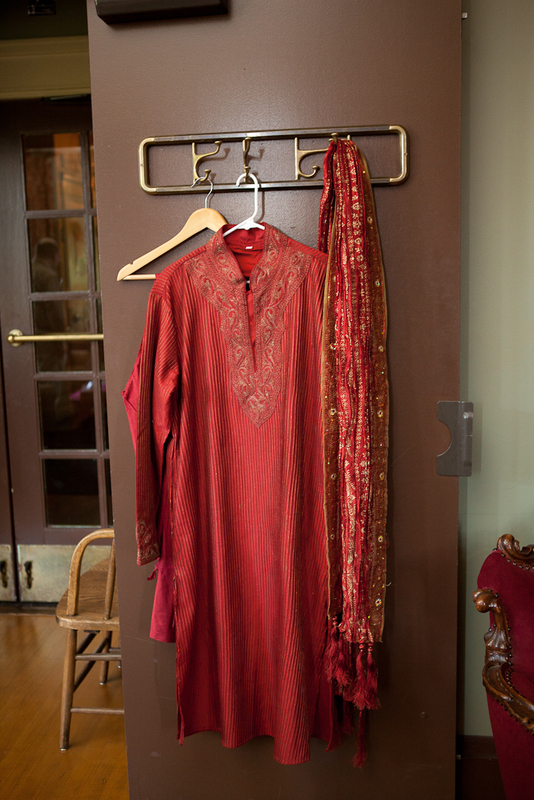 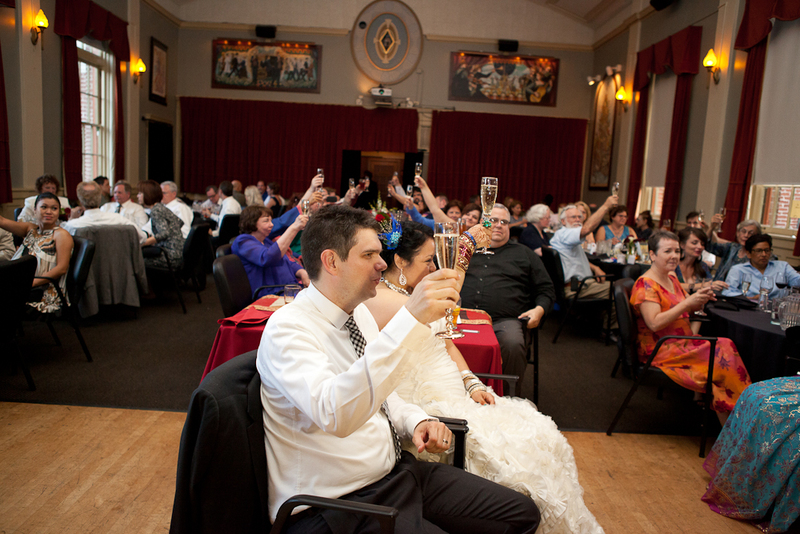 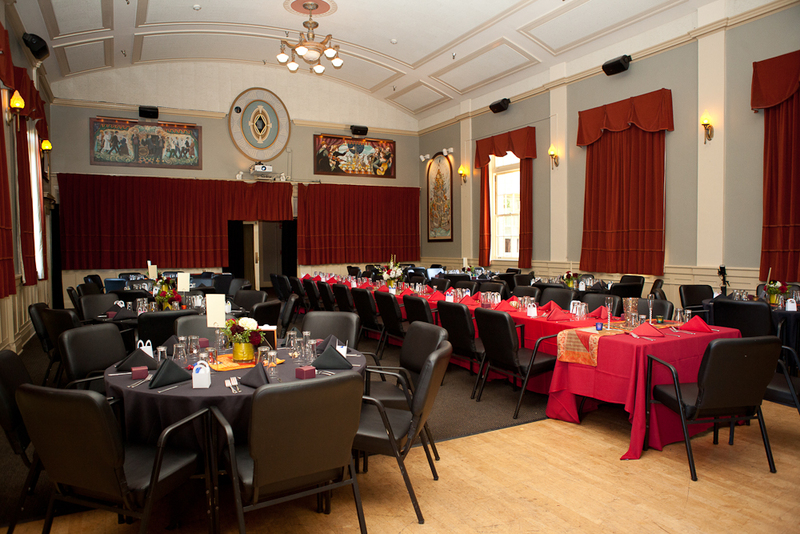 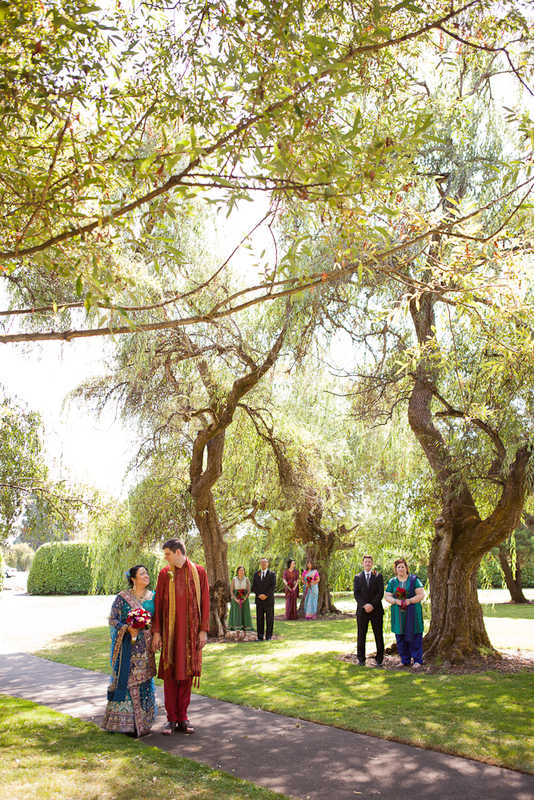 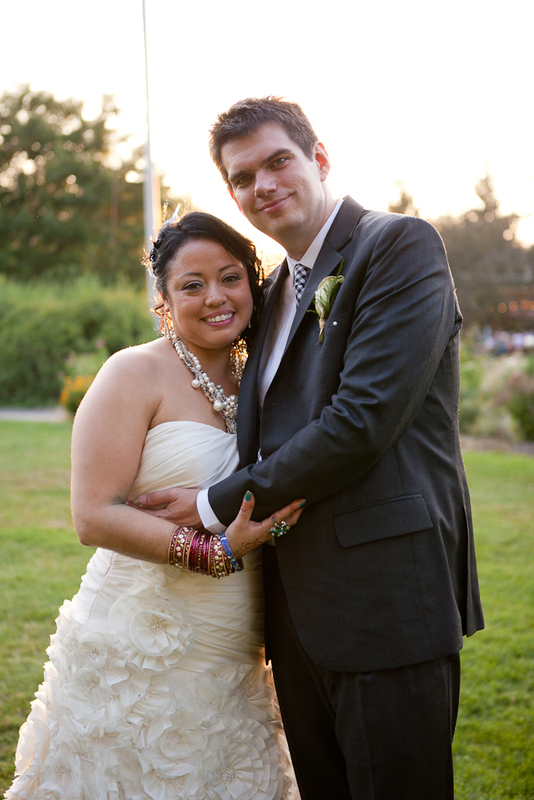 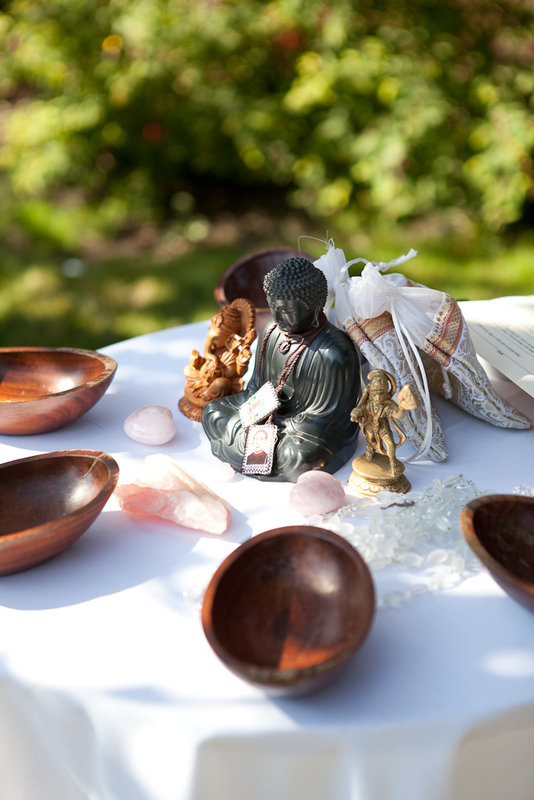 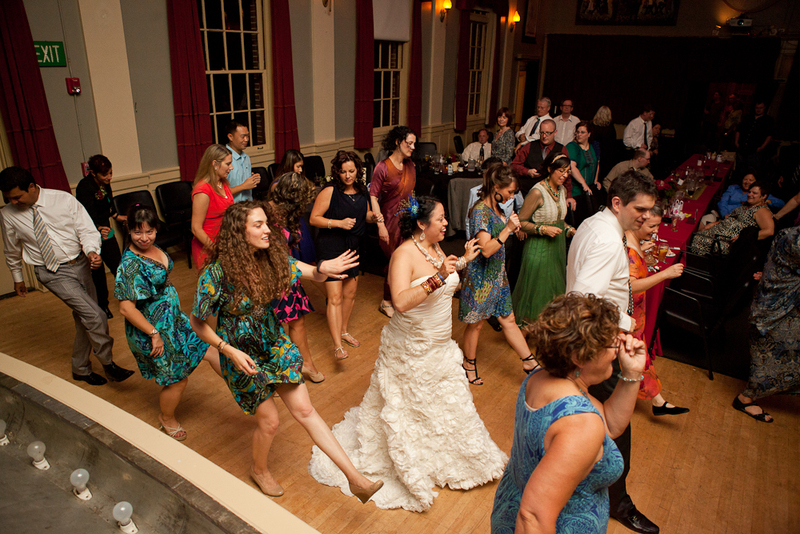 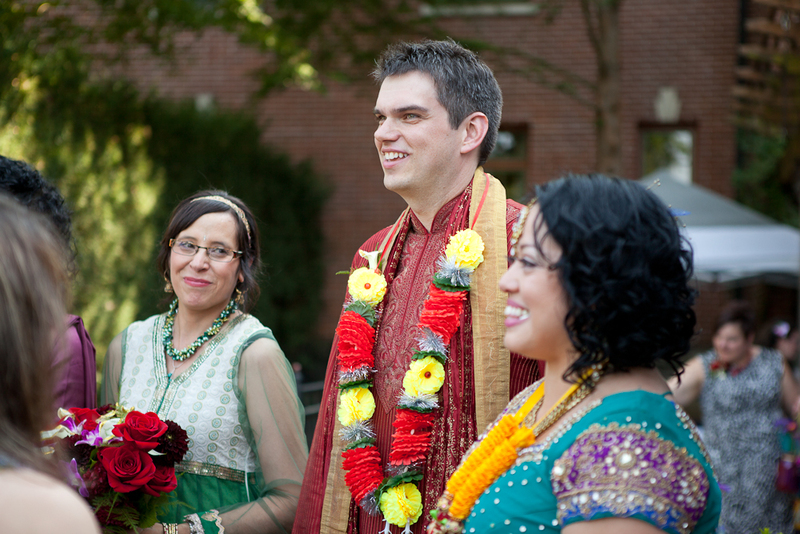 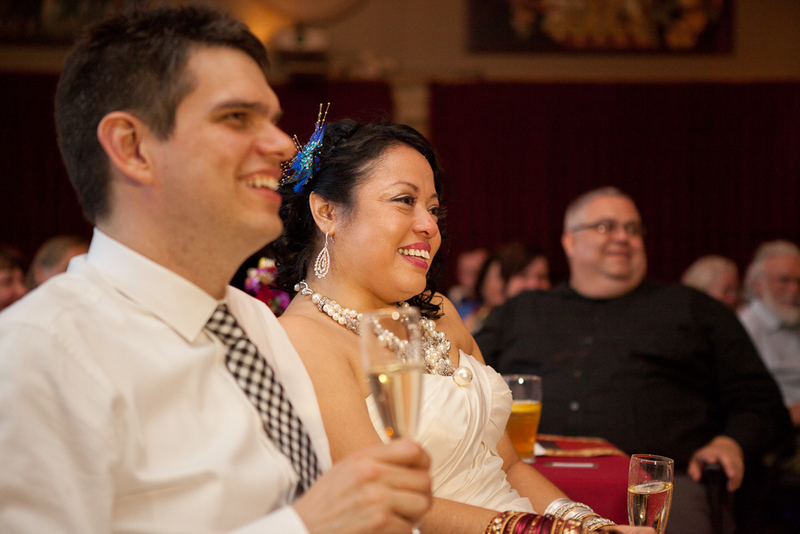 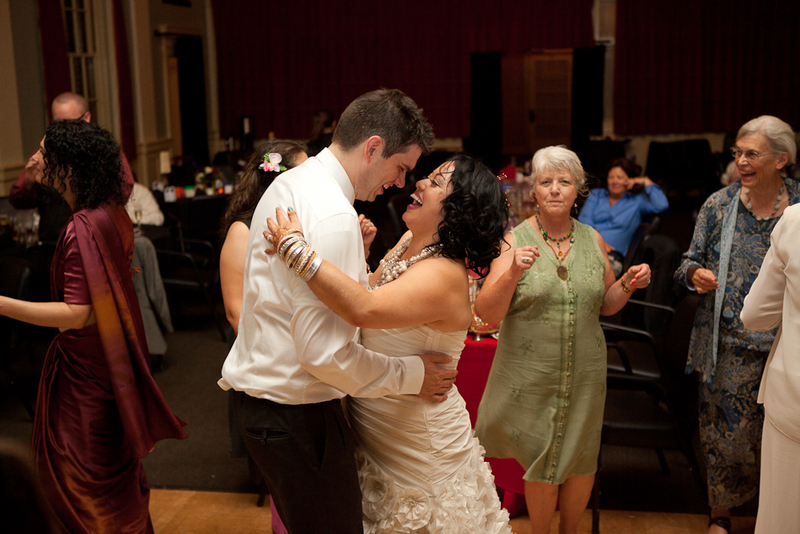 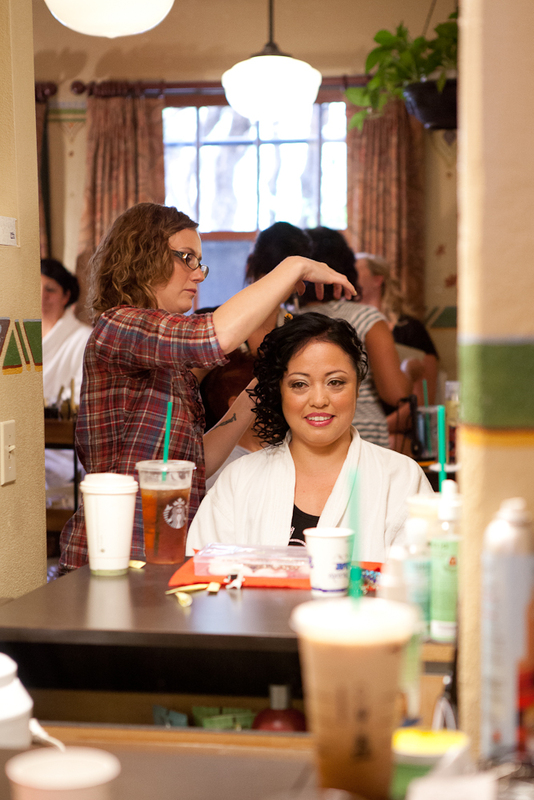 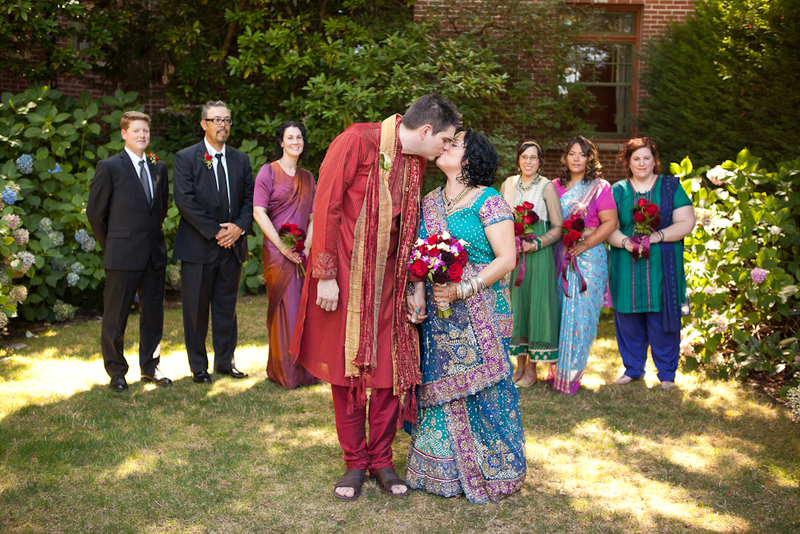 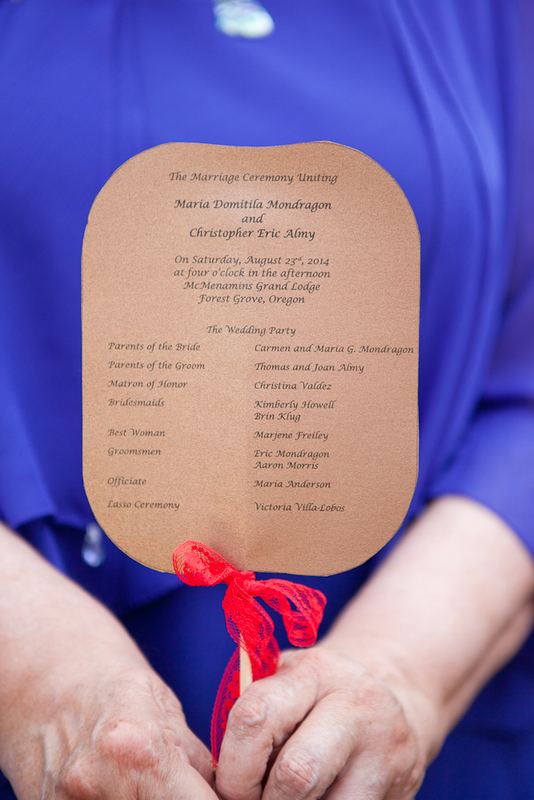 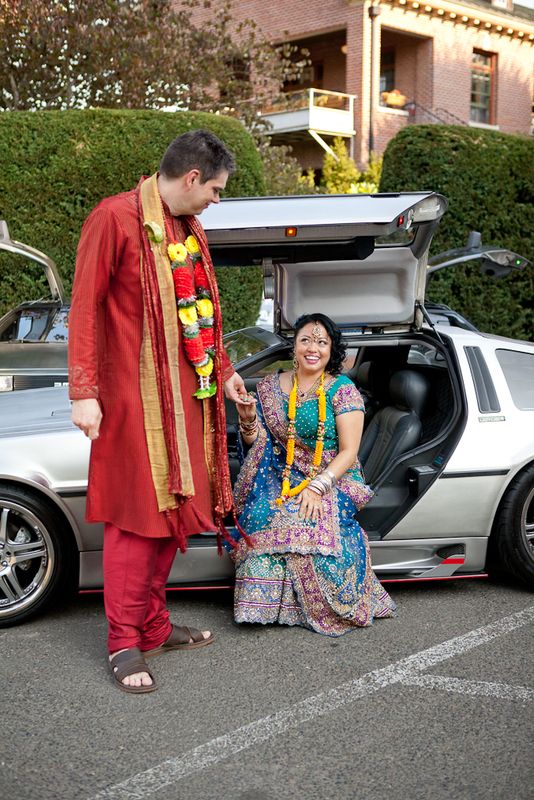 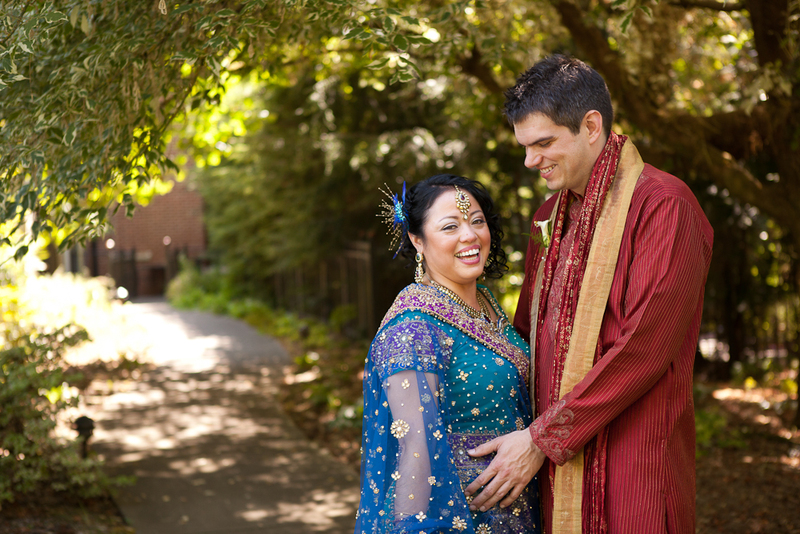 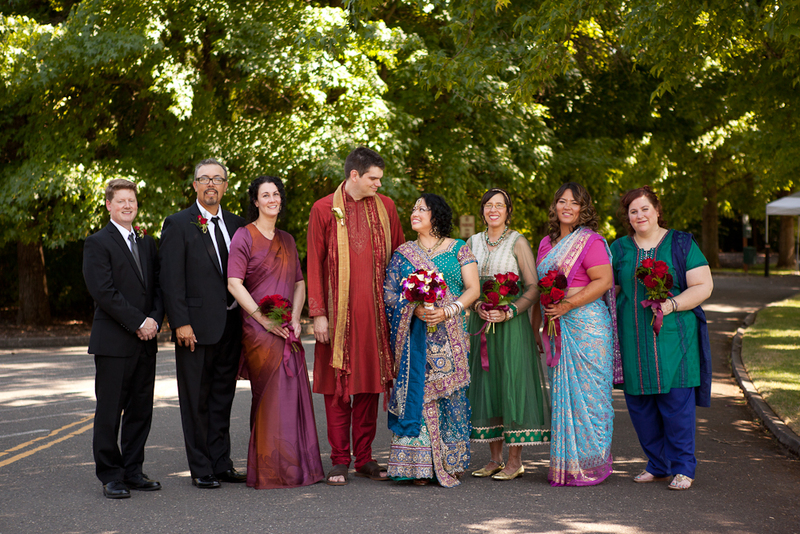 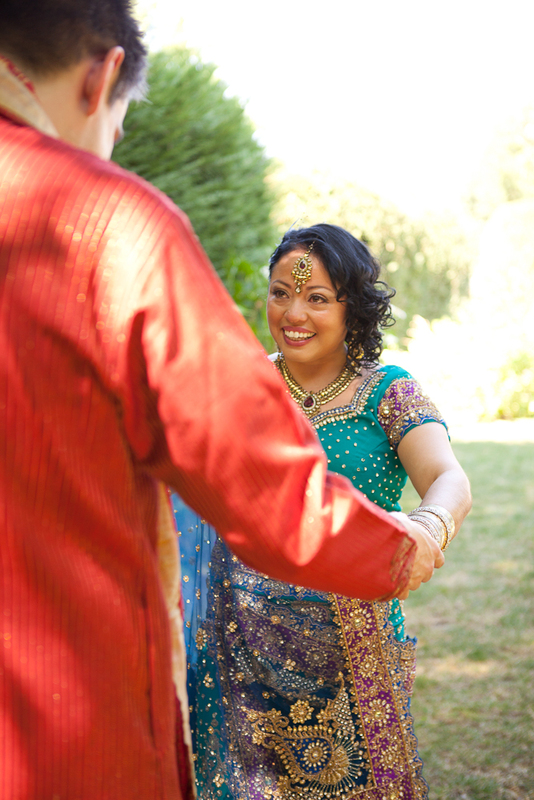 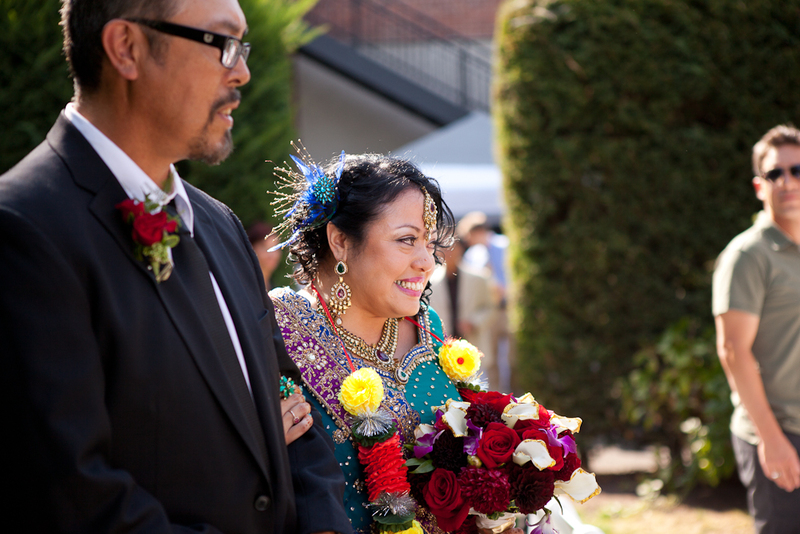 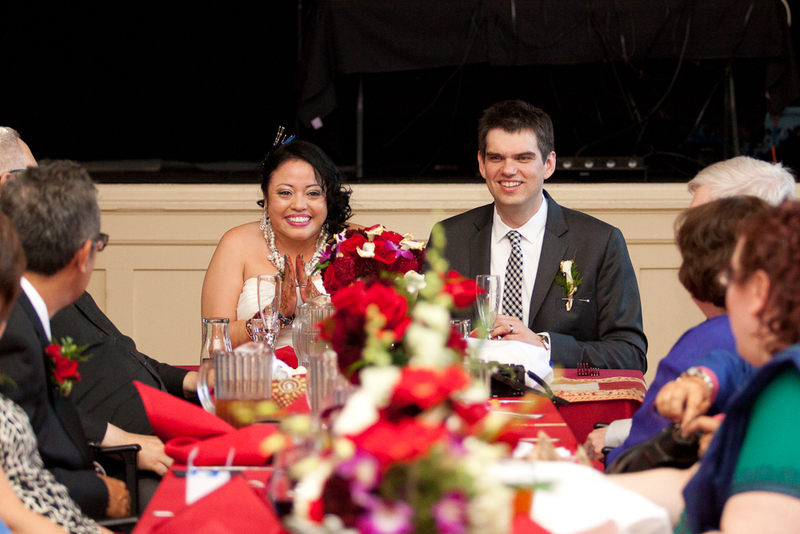 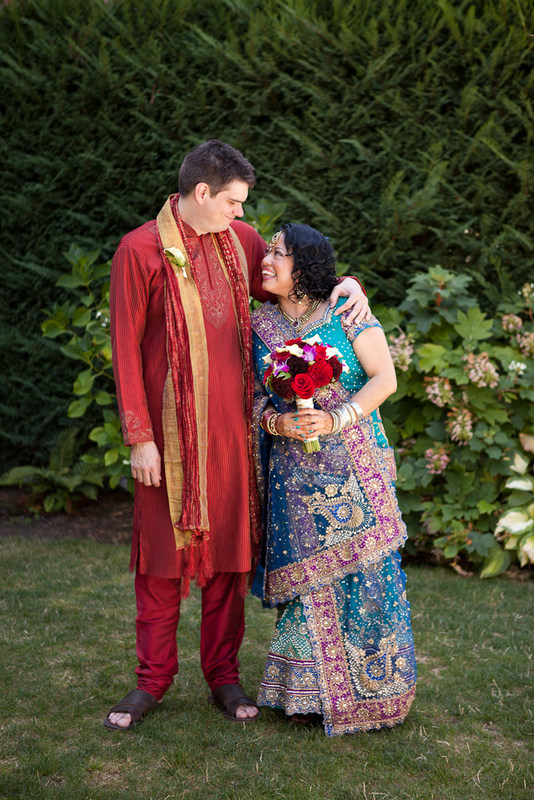 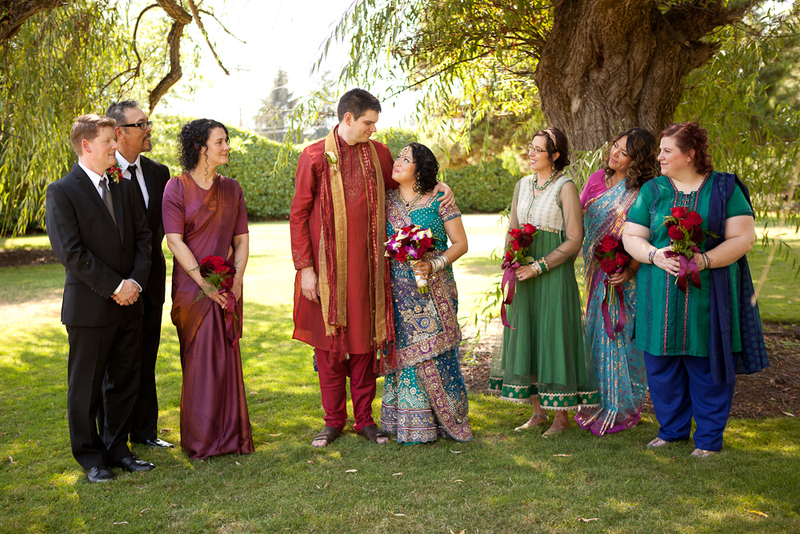 Maria and Chris were married in Catching’s Grove at the Grand Lodge McMenamins in Forest Grove, Oregon. 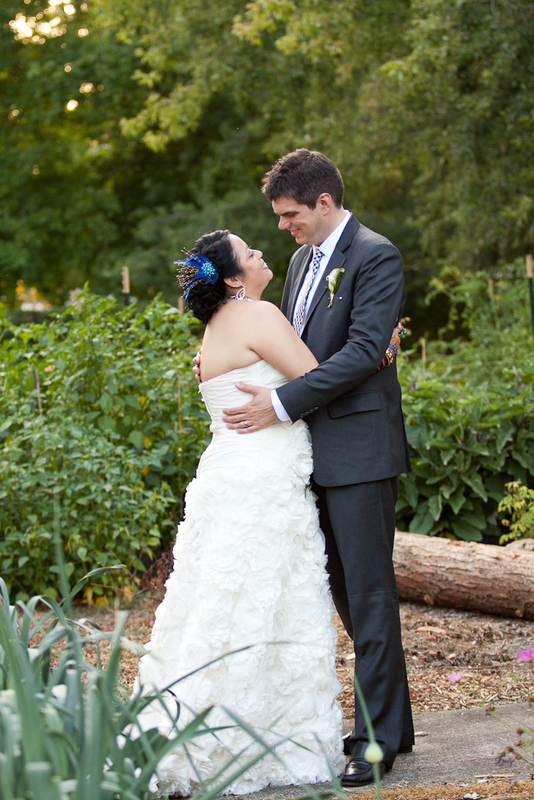 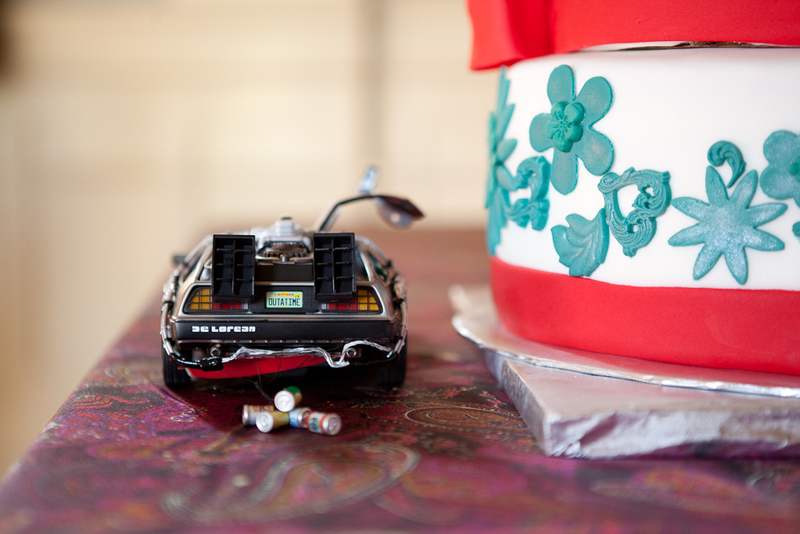 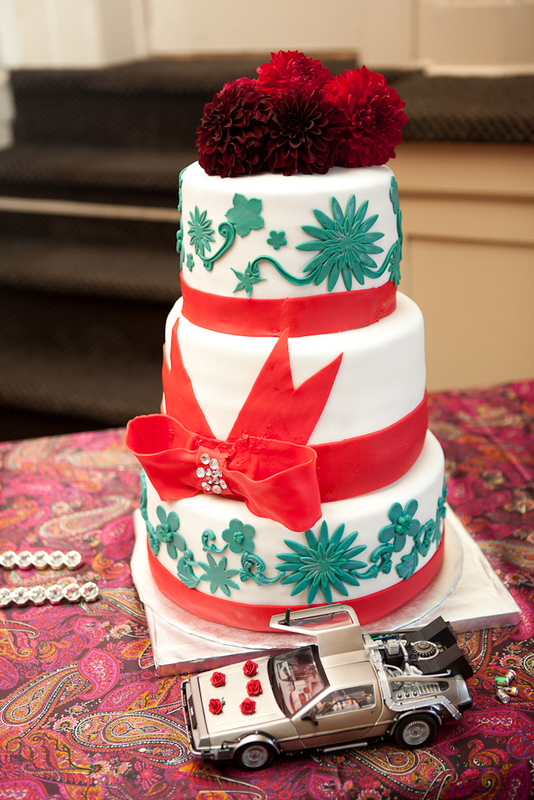 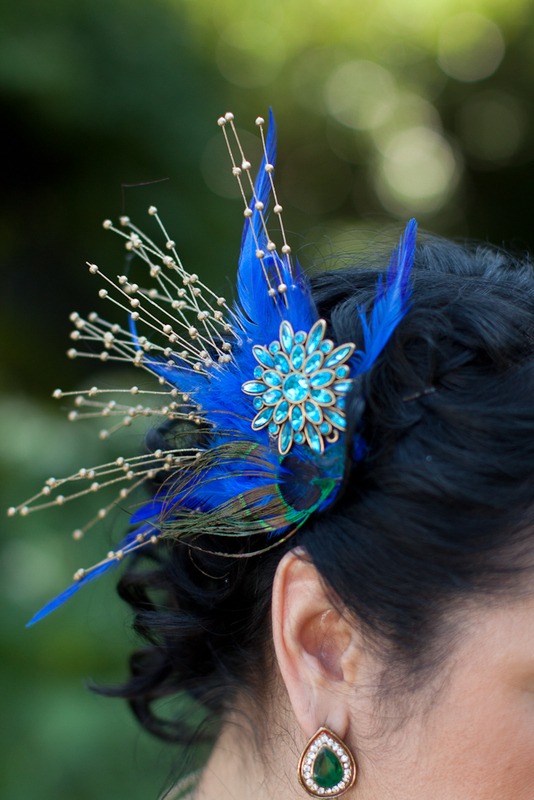 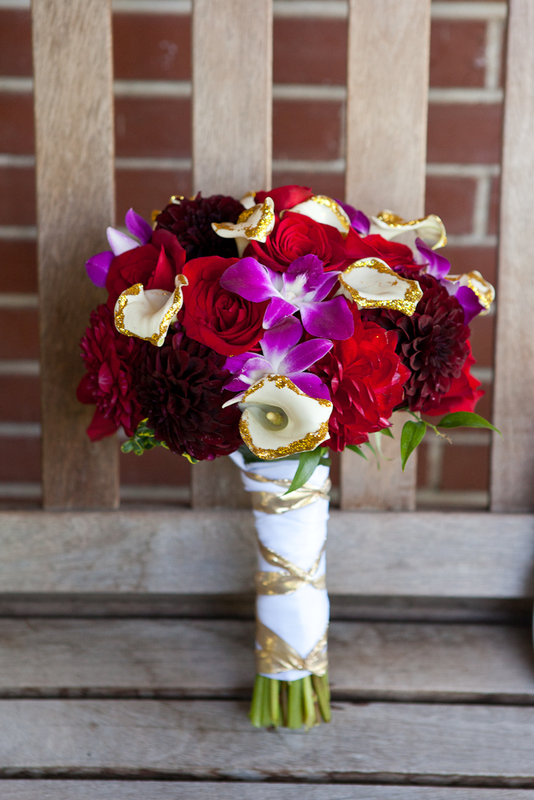 There were so many gorgeous details that went in to this wedding (let’s see if I can remember them all!). 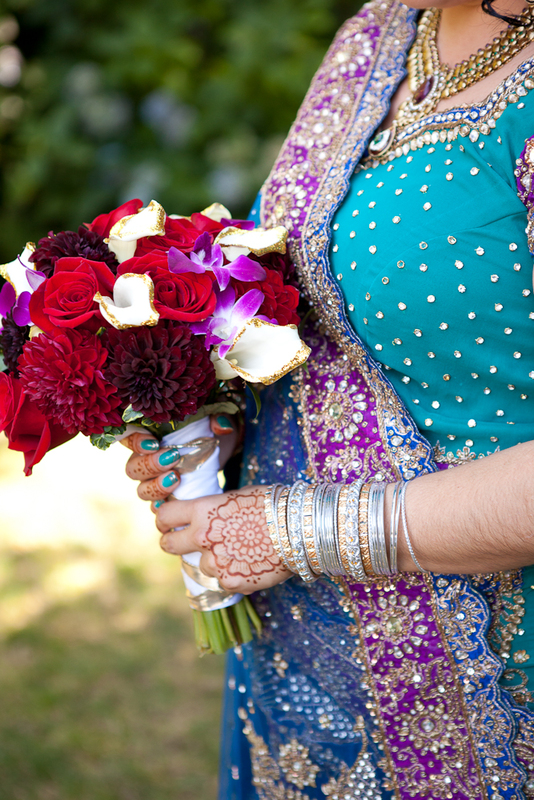 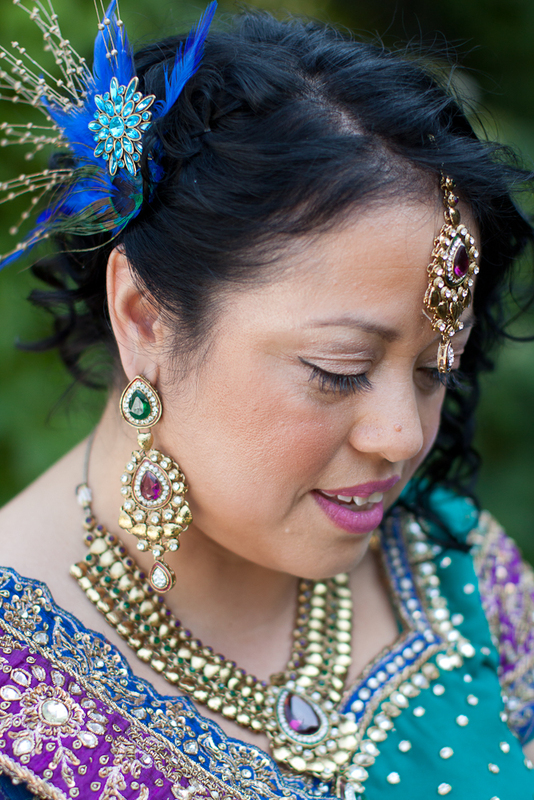 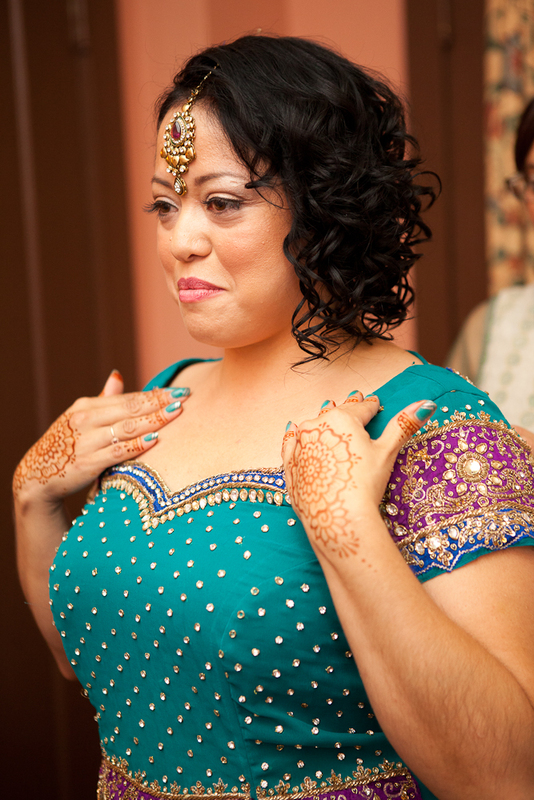 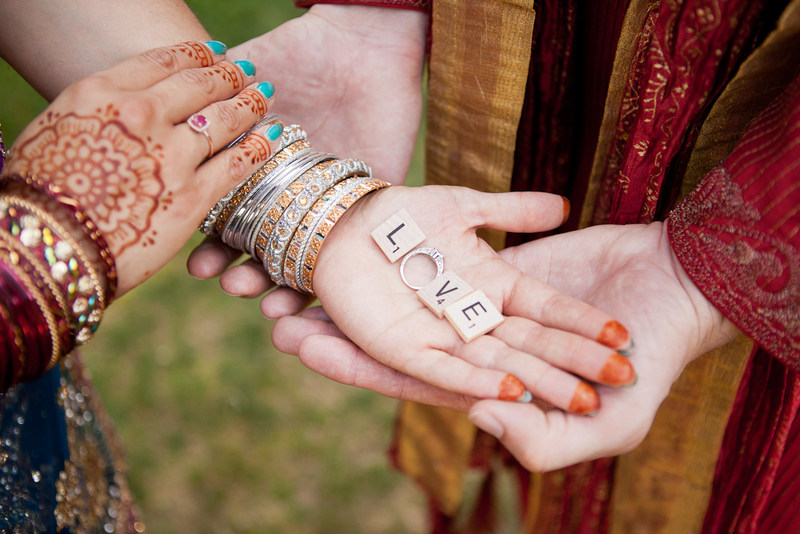 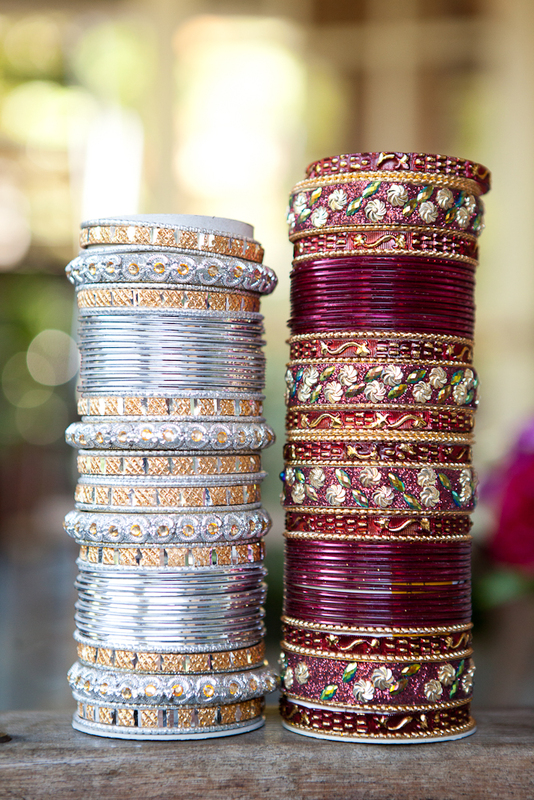 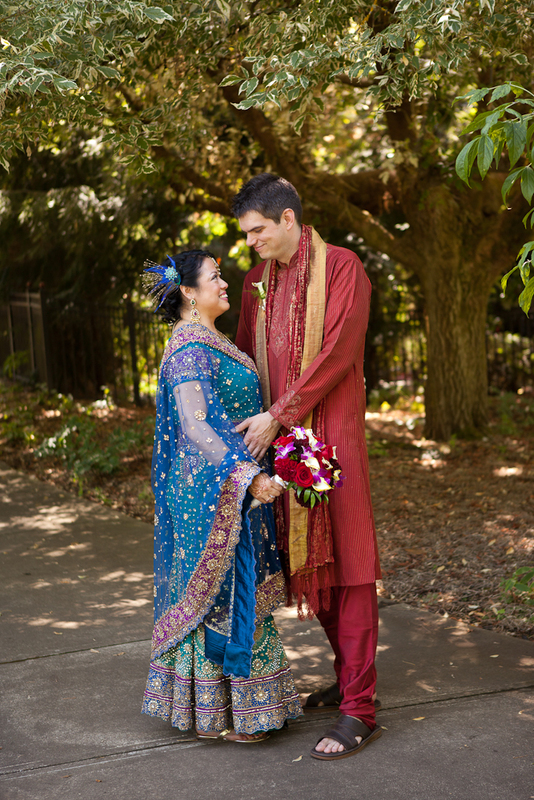 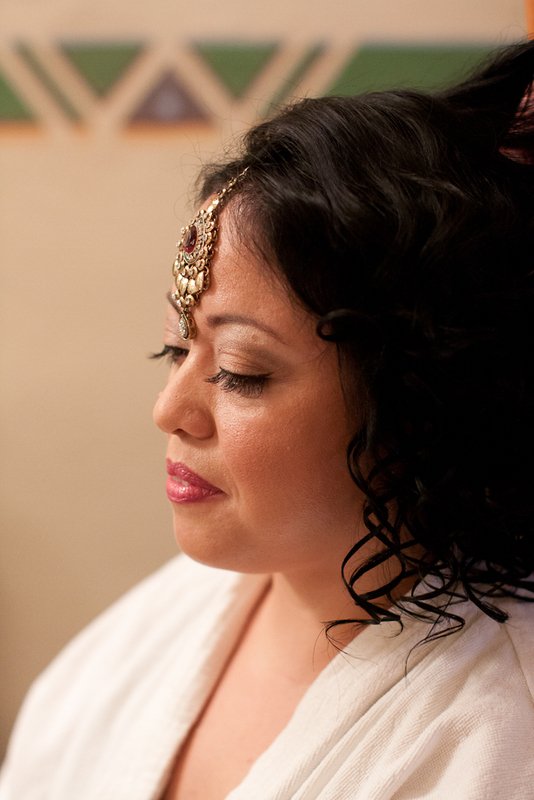 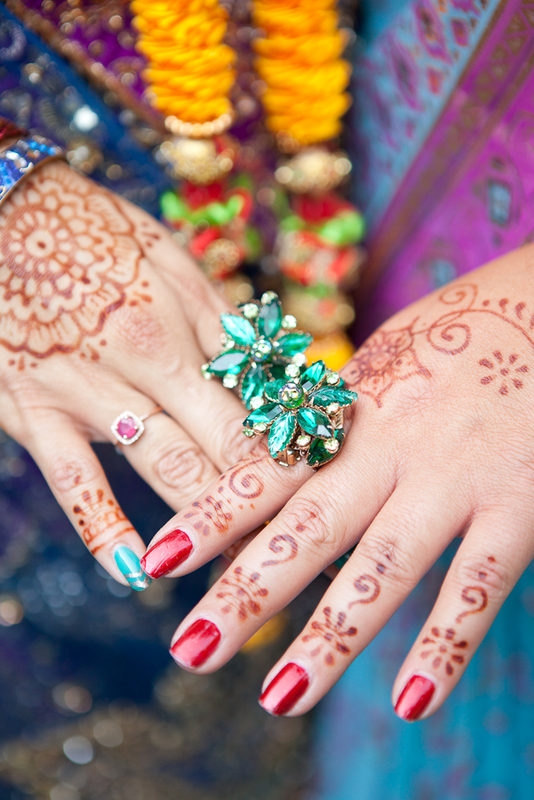 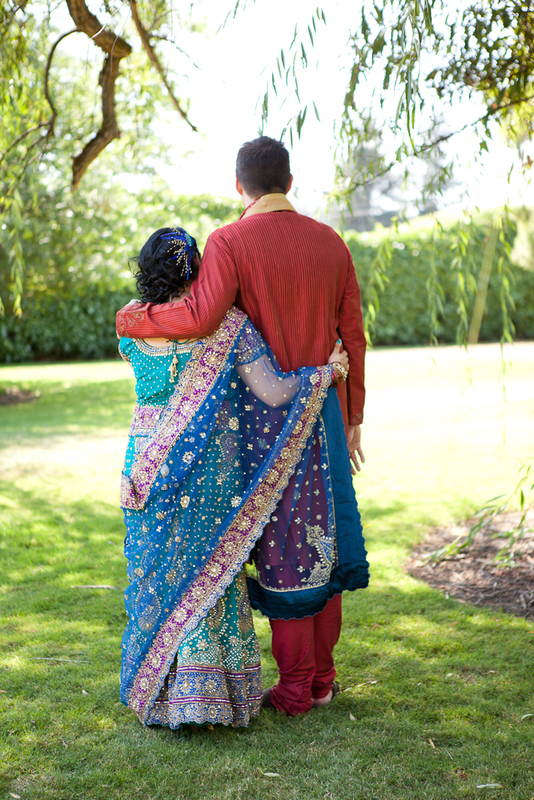 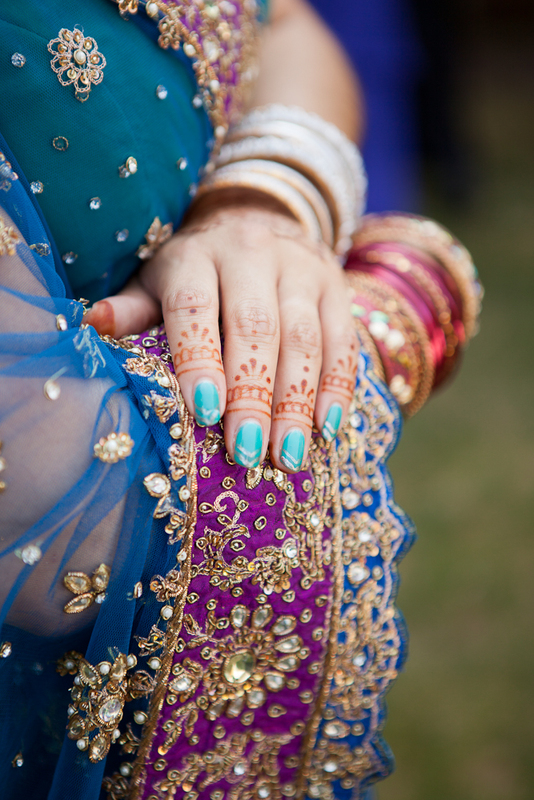 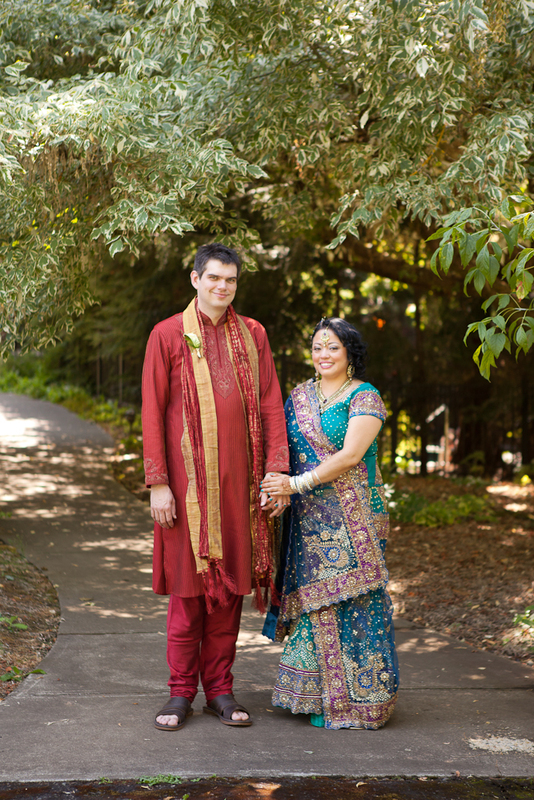 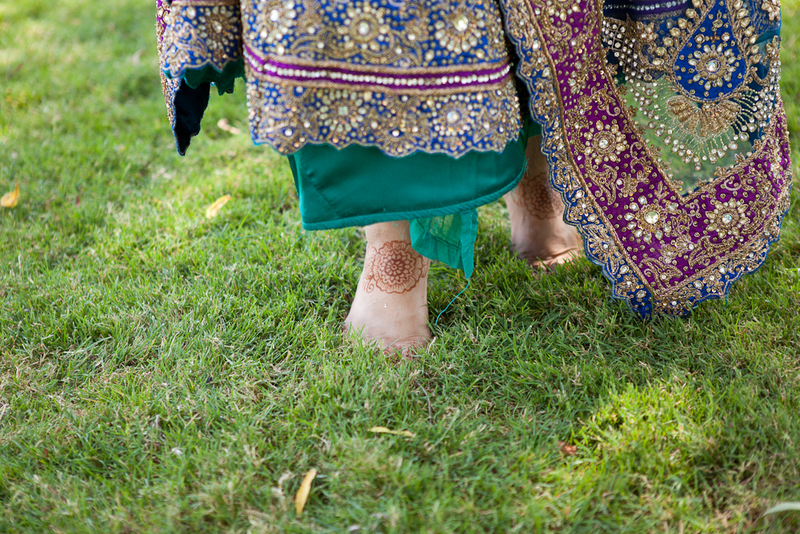 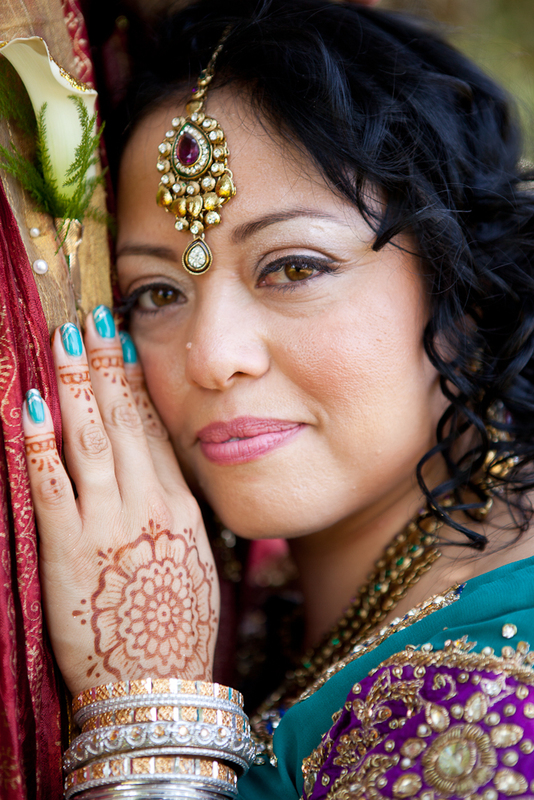 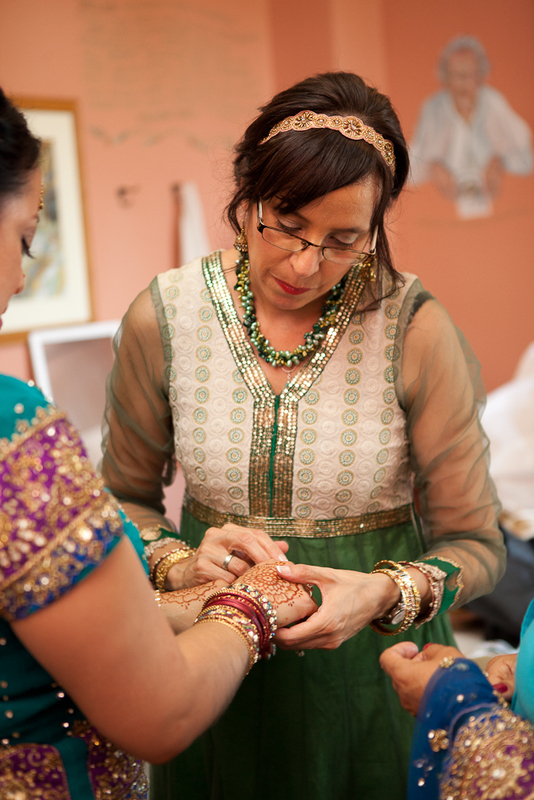 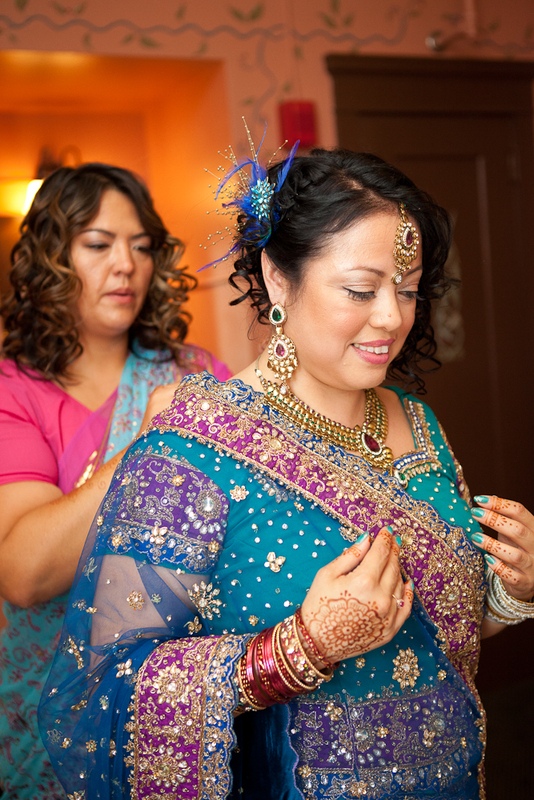 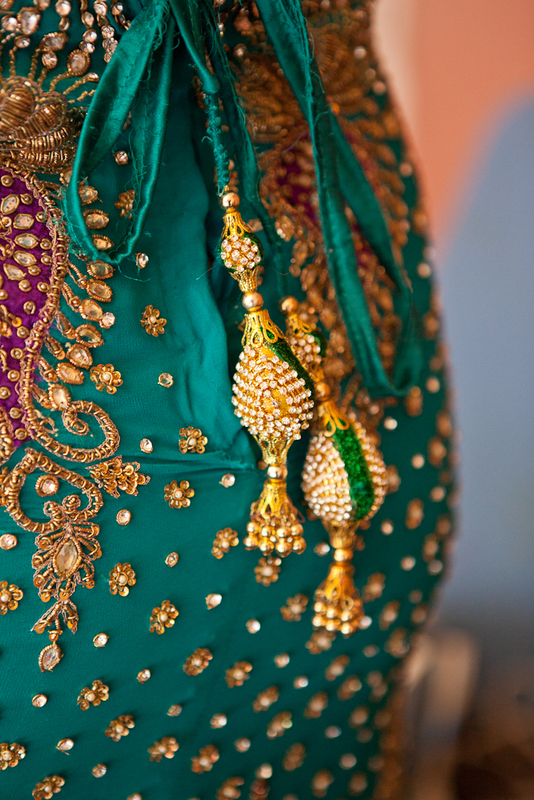 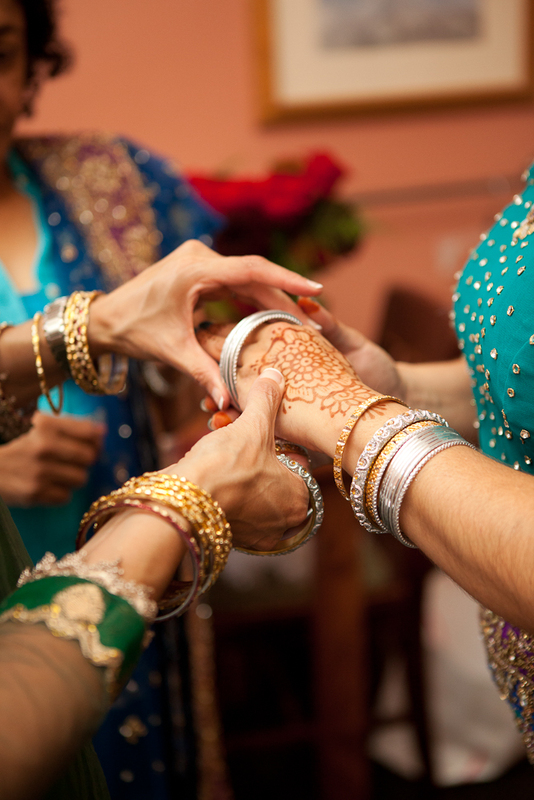 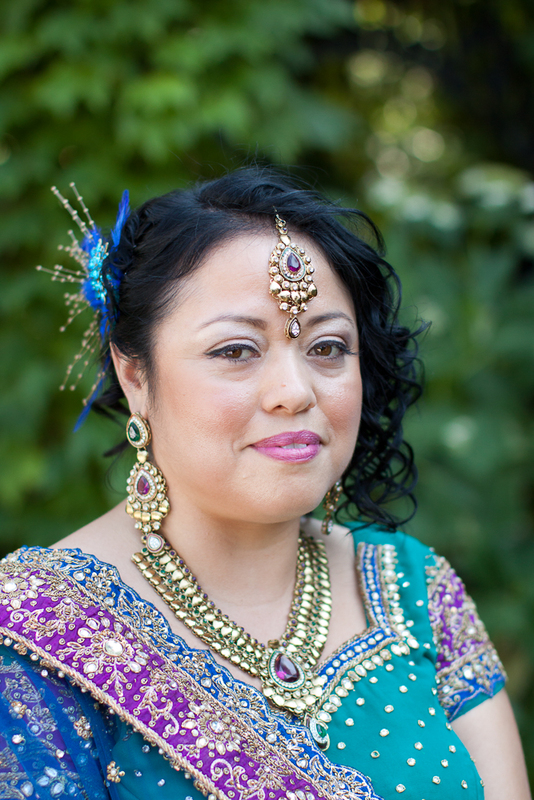 Maria’s first wedding outfit, her blue and purple and beaded sari, draped over an equally beautiful teal skirt embroidered with many, many, beads, was absolutely stunning – and the henna on her hands and feet looked amazing with the gold jewelry and the ample amount of red and silver bangles she wore during the ceremony. 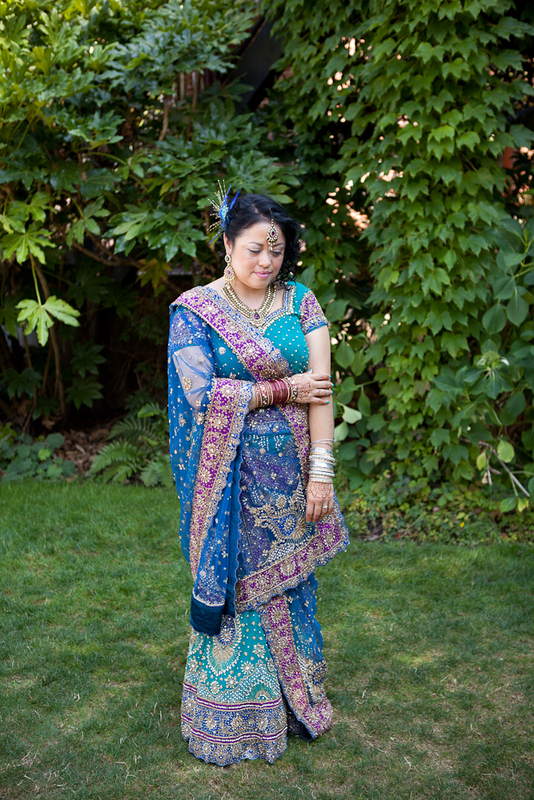 Her attendants also looked beautiful, each dressed in their own sari. 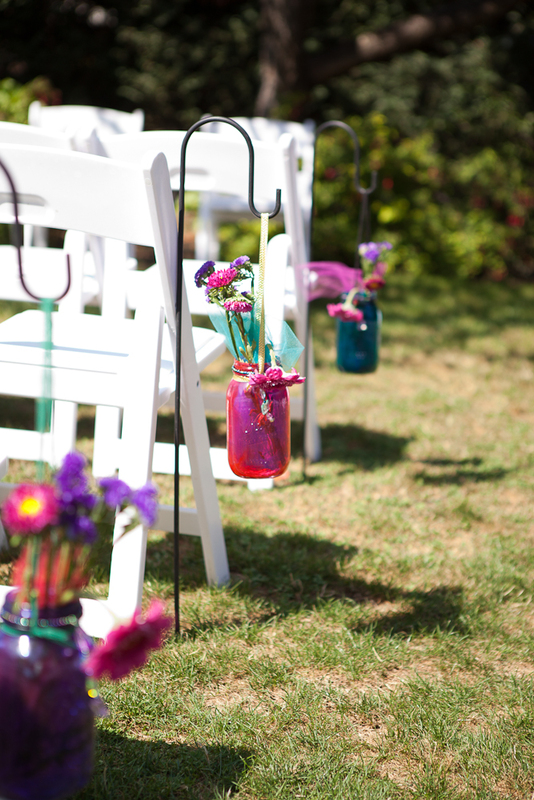 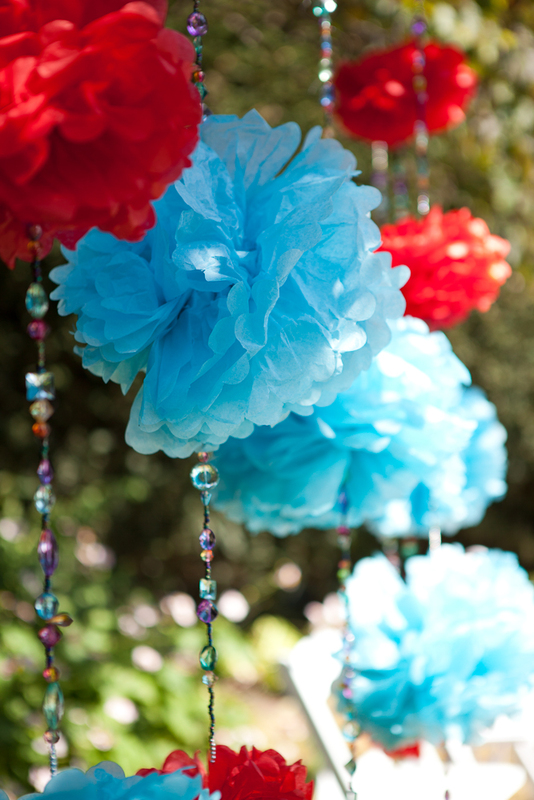 During the ceremony multi-colored mason jars with flowers lined the aisles, and hanging behind the ceremony site were beaded strings with red and teal puffs on them. 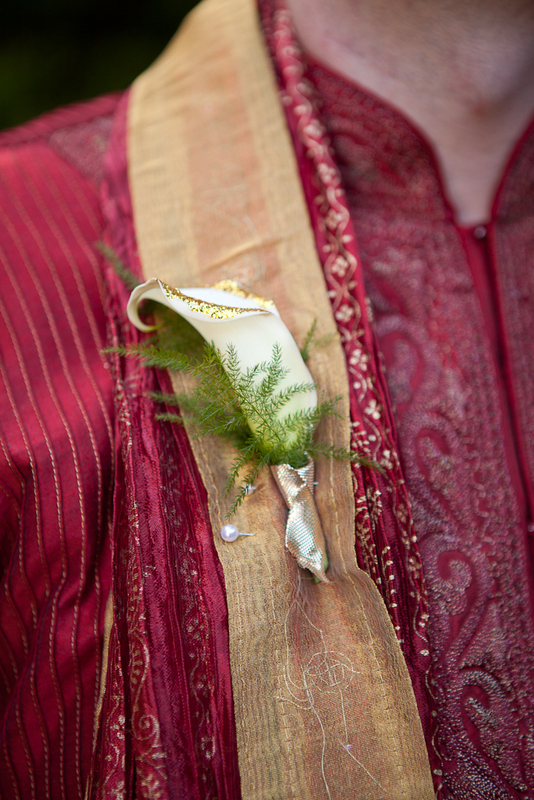 Maria’s bouquet had flowers with the tips dipped in gold glitter (similar to Chris’ boutonniere, which was a white flower with gold glitter on the edges). 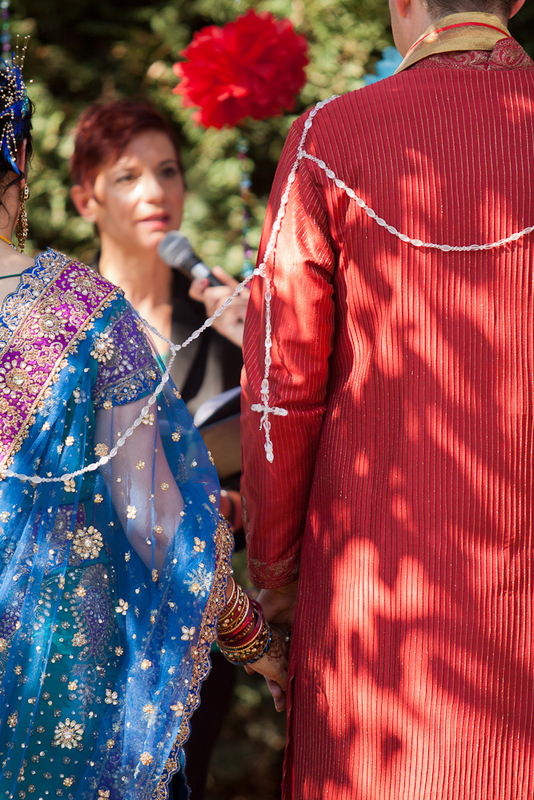 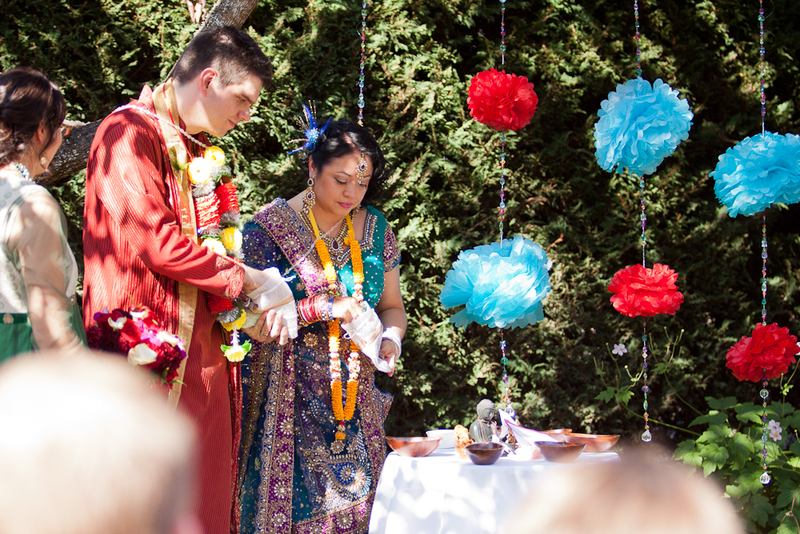 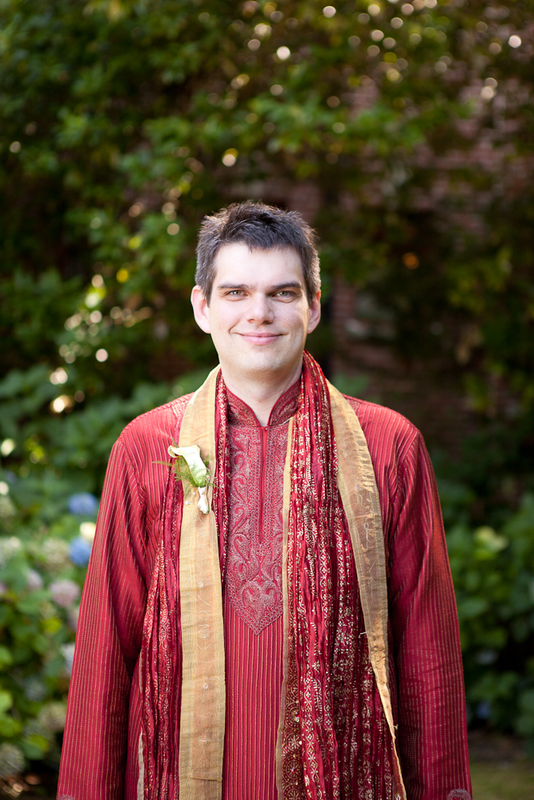 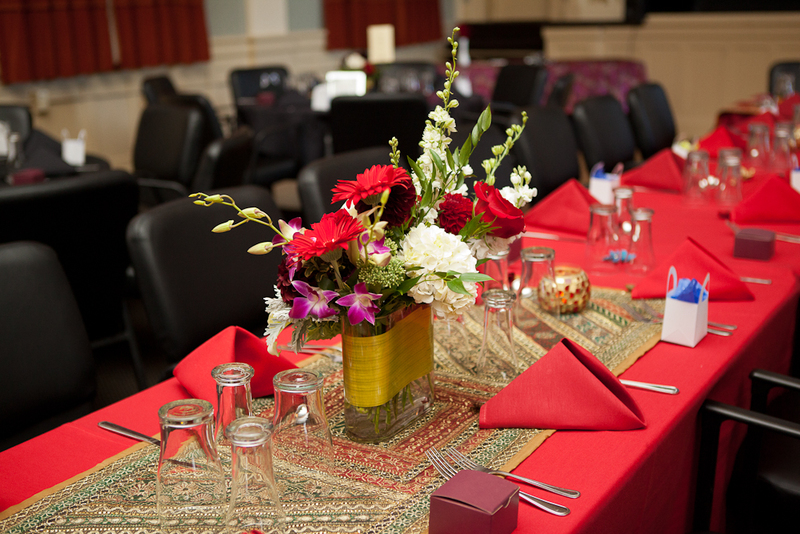 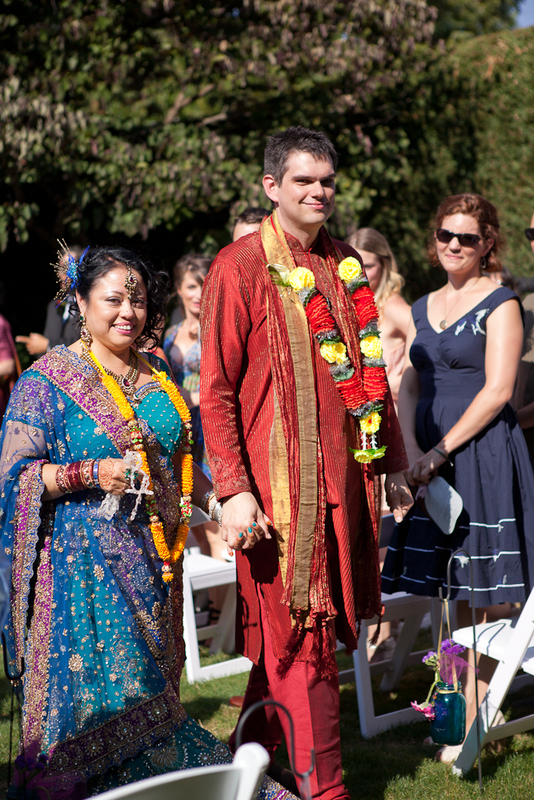 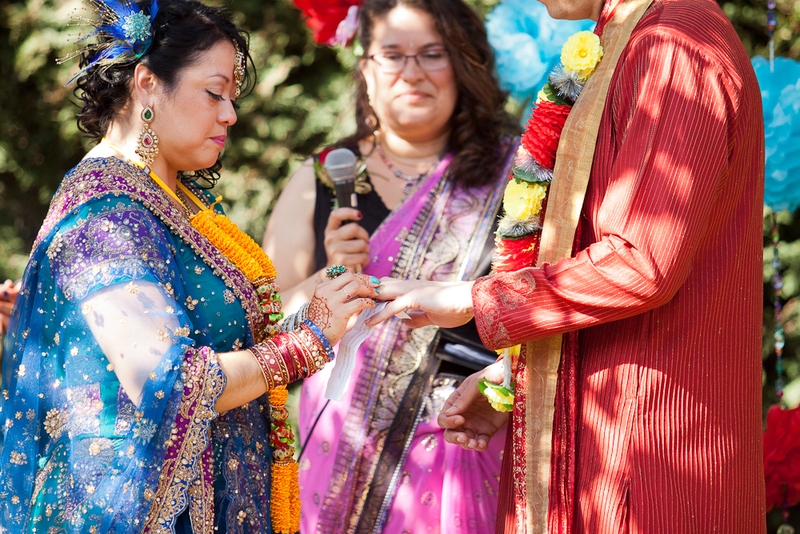 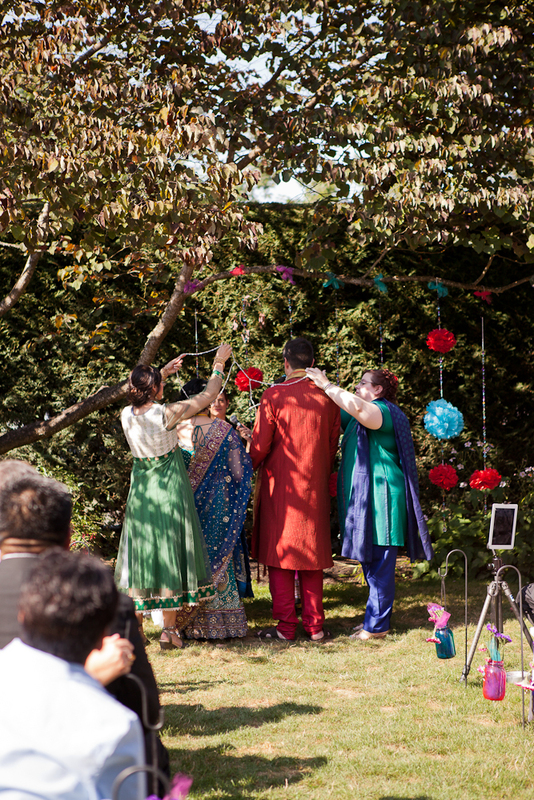 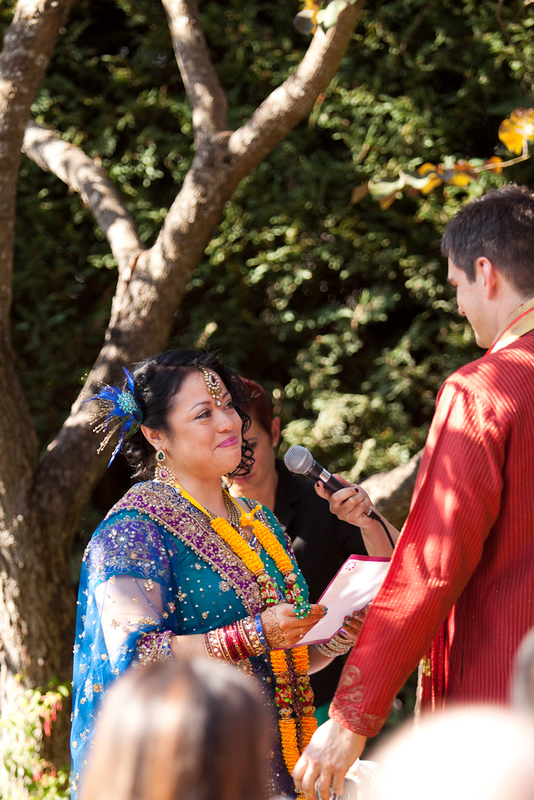 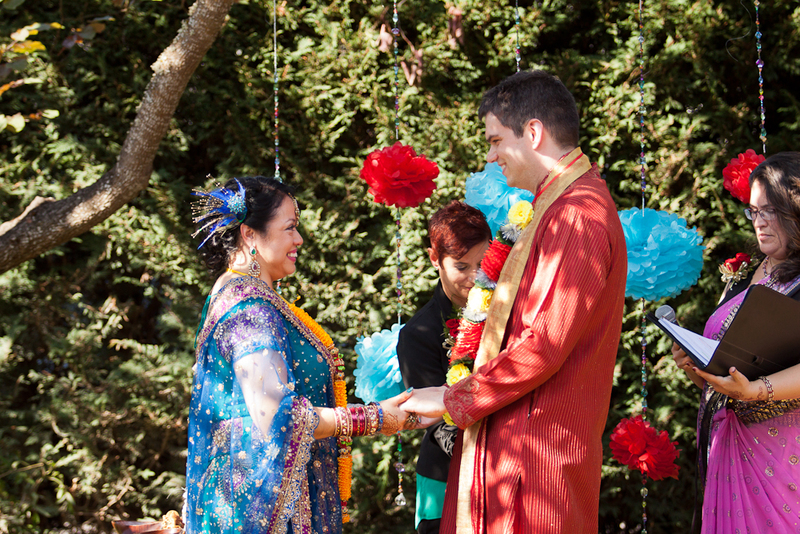 The ceremony itself was a wonderful blend of languages and cultures, and it included a traditional lasso ceremony. 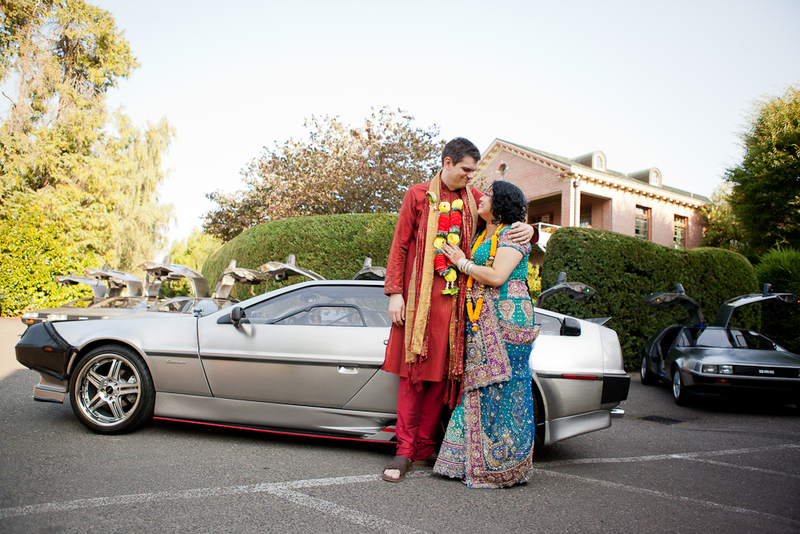 Chris happens to be a member of a DeLorean car club, and during the cocktail hour (much to the delight of everyone) seven DeLoreans parked near the patio, doors up, for guests to check out and take pictures with. 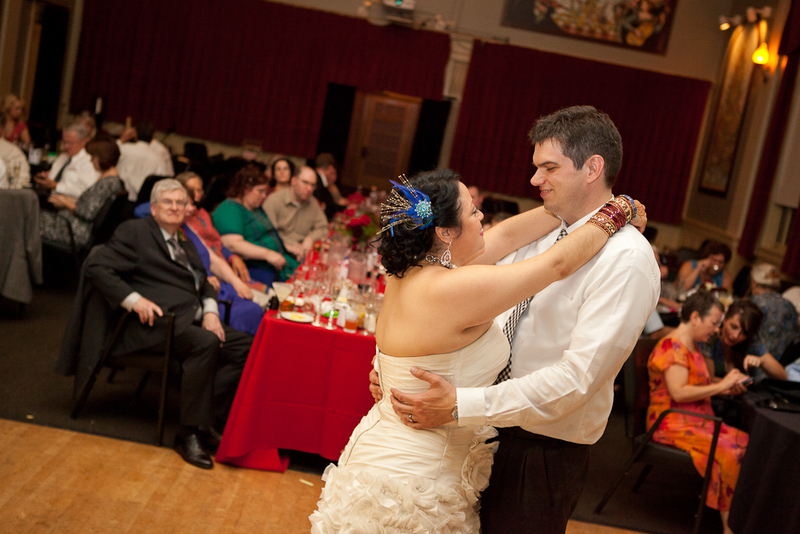 After that, Maria and Chris changed into a second set of party clothes (Maria’s second dress was just gorgeous), and headed up to the Compass Room for the reception. 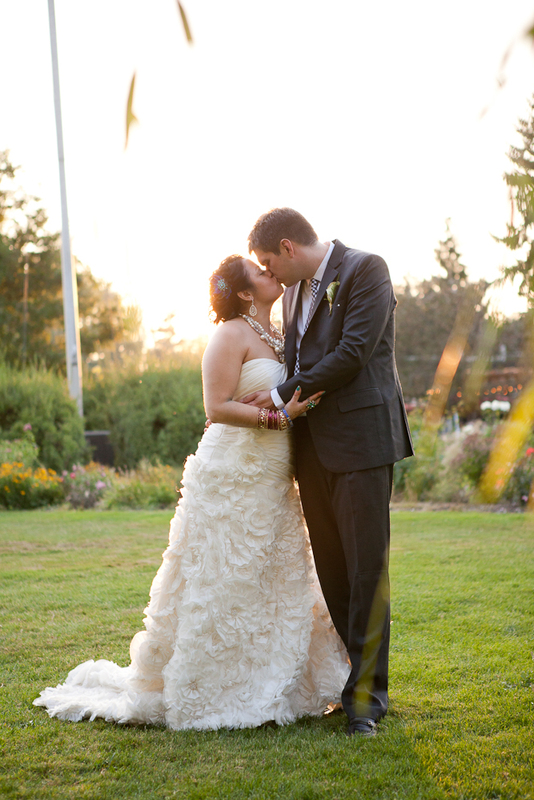 We headed outside as guests finished dinner, and I could not have asked for a more beautiful sunset for the last few portraits of the day. 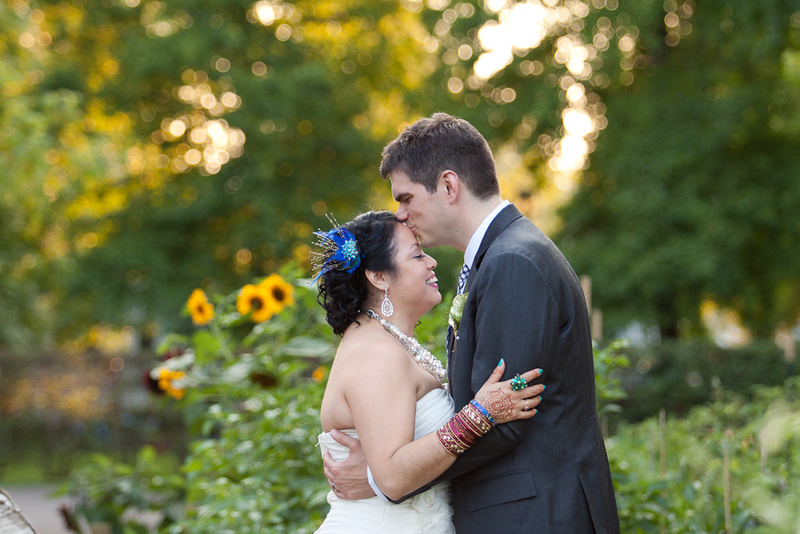 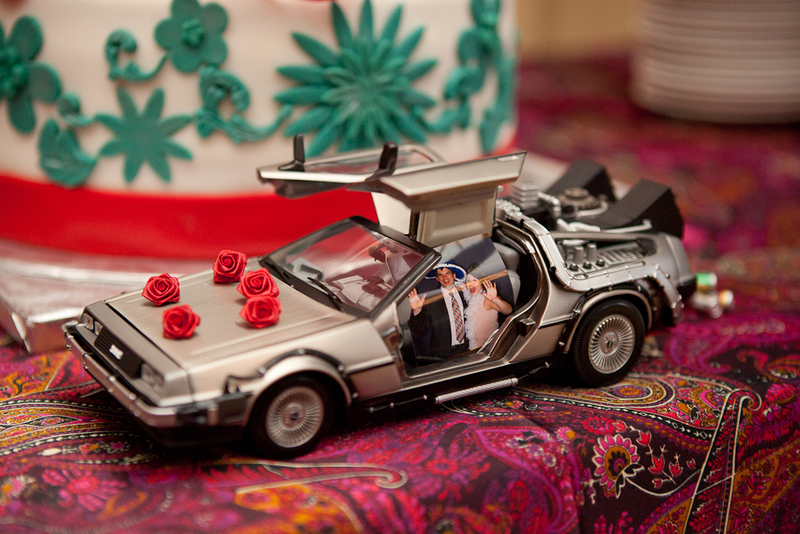 What an incredible wedding to get to photograph!